Above Right: Saakashvili At Hanukkah Ceremonies At Tbilisi’s Big Synagogue December 18 2006 Here. Rice & Bush’s ‘war of words’ is not matched by Europe with its reticence to speak out against Russia - which recently announced a further increase of gas exports to the continent. Indeed, Europe fears alienating its provider of hot showers. Ignoring Saakashvili’s rebuke, Rice again demanded that Moscow withdraw its forces. But while Rice lectured and Saakashvili sulked, a Russian convoy advanced to within 34 miles of Tbilisi, Georgia’s capital. — “The Georgian leader met with all of the senior officials in the Israeli government and received an honorary doctorate from the University of Haifa. In his acceptance speech Saakashvili called Georgians “the Jews of our time.” He compared President Putin’s anti-Georgian policies to the anti-Semitic campaigns of Russian Empress Catherine I.” — Here. — “Israeli weapons have proved very effective. We have two Israeli cabinet ministers, one deals with war [Defense Minister David Kezerashvili], and the other with negotiations [Minister for Territorial Integration Temur Yakobashvili]. Both war and peace are in the hands of Israeli Jews.” — Here. For The Best Coverage Of The Georgian Conflict Click Rense.com Here. I just had to change to a different Web Hosting Service due to pressure from the ADL to my former Web Hosting Company’s Data Center, RackForce. I have incurred much expense. Please consider making a *donation* to help out with my continual costs & to keep Real Jew News online. OK, just what sort of bear is Medvedev? He could be a Jewish bear, because his name is an old Jewish (especially Argentine) name; but I think he’s now probably more of a Gentile than his ancestors were ever once Jewish. I notice that the very name Medvedev means “bear”, and there’s a Medved Zoo somewhere with bears, which could be construed as a counterpart of the confines of the Jews around politicians today - someone called US President George Bush a “monkey” on another thread. Russia is known as “the nation of the bear”, but why is that? Is it because Jews have had an obsession with setting up rulers there in the style of the bear-man King Arthur (Artur means “bear” in Welsh) who exemplifies a ‘Davidic’ ruler of an ideal kingdom in the legends? Ok, so you think it’s because the Russ-kies are a tough and indomitable bear-like breed; but then didn’t they quail under a Jewish Soviet for more than seventy years, set up by a few bars of Rothschild gold and a bunch of skinny Jews from New York’s Lower East side. I think Putin, as an ethnic White Russian, may have more personal integrity than the filthy hypocrites who have opposed him in the Caucasus conflict over the oil and gas exported from the Azerbaijan; but then maybe he’s just on a longer leash from his Jewish handlers for a while - it’ll be interesting to see if there is another attempt on his life. Judicial-inc figures Medvedev as two-faced, and implies that his background in “the Soviet of People’s Deputies, aka secret police” is latent pro-Jewish evil waiting to reassert itself, which seems a little too inflammatory. But to countenance the idea that a “soviet” (i.e., ‘Round Table’ Jewish council) isn’t still in control in or over every nation by Jewish gold is a much harder call. We have been through this before and you are pushing the envelope. Medvedev is NOT Jewish. His mother was NOT Jewish. Medvedev is a baptized Orthodox Christian. Don’t push your racist innuendos on this site, Real Jew News, because this site believes in the Orthodox “Catholic” (”whole” in each of its locations & “universal” in its embrace) Church which embraces all races, all nations, all peoples. 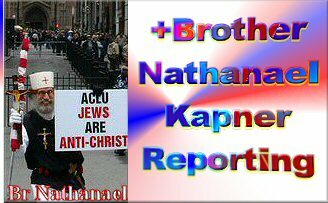 Real Jew News is an Orthodox Christian site at its center and integration and will remain affirming this. And really, all that you assert are only innuendos. Putin has purged out all of the Jews from political power my dear frother at the mouth. One more racist froth from you and you will be a *only* a viewer of Real Jew News. Angel of the South - for the pagan bear and dragon cult look no further than the Crown and the City in London. This is the entity that clearly carries the Draco standard of the Old Religion. All that stuff was driven out of the nations of the Caucasus when those nations climbed out of the sinkhole of paganism and converted to the Christic Light of the Evangel. The Old Religion was driven out of Britain with the preaching of Sts Columba, Ireneus, Padraic. It was St Padraic who broke the Rede of an Druidh Breathrecas at Tara. When he drove the Nedders (Egyptian Netters - Serpents) out of Eire, that is the Druids. Now it is all making a huge comeback everywhere - except in Russia. The Archbp (so called ) of Canterbury, Rowan Williams is a Druid. The EU recognizes the Imperial Dragon Court. Glastonbury of the famous Abbey has reverted to the Ynys Witrin of the ancient cult. Lots of homage to the Bear of the Votadini there - supposedly his burial place. The fifth European Parliament has picked up this Crystal Palace theme. The anti-pope in Rome sports the Egyptian hieroglyph of the Osirian throne (the Djed) on his coat of arms - also the little bear. If you want to look at a bear nation, look at Great Britain which I think signed over its national sovereignty to the EU this N. summer. Solstice would have been a good time if they are as superstitious as I think they are. What I think is interesting, is the fact that Putin and the Russian troops have moved their nuclear missle launchers in the region, the ones capable of delivering nuclear based missles that either are meant to kill lots of life or even ones meant to be part of an EMP attack. And yet NATO doesn’t seem to get what is going on due to their excessive pride and egos. The military leaders have made it quite clear that if any of the Russian allies get attacked, they will be willing to bring nuclear missles into defense of their allies. And just yesterday Putin made it clear that Poland is but one battle away from having nuclear weapons used on it too. The zionists seem to be running their lives only by ego and pride, and that will spell disaster for the human race in the end. God surely will see to it that these zionists have the most pain possible in eternity in hell, as they are fully deserving of the total wrath of God by how they are living their lives so much against God’s will in the present moment. So Rothschilds, Morgans, Rockefellers, etc… if you ar reading this, be forewarned that God never promised your evil souls a spot in heaven, but He did set aside a spot for your souls in hell. the West: Zionist camp and Marxist camp. Jews’ bad influence on the course of this nation. play an important role in America. driving psychology - of progressive Jews. growing entitlements. The evidence is stark! “It’s as if he [Ted Koppel] hasn’t been in the U.S.
“The Forward never resisted change. and one that’s now dangerously unsafe! thinking, fighting progressives’ evil works). programs, nearly all of which are still in force! to reverse this bad course. of their inherently low intelligence and class envy). fighting for the very programs we now suffer to fix. Way, to that evil end. predictor of what is to come. failures,” which are left unidentified. f-e-e-e-lings to find a soundly rational mind. for multiracial Jewish families . . .
civilization while extolling minority cultures. permission to dispense aspirin to them. and leaves children hooked on escapism. customers, against the wishes of her employer. are to completing their plan). my essay, “Blacks’ Sucker-the-Man Ruse”). This video is excellent on the Second American Revolution, a revolution to remove from politics any person that is failing to support the US Constitution and the long established traditions of our nation. An excellent must read book about Chechen terrorism and the only one I know about it is Paul Murphy’s book Wolves of Islam. He is no arm chair analysis but a former CIA counter terrorism agent operating in Russia between 94-2000. Although mentioned in the inside sleeve it was published before the Beslan massacre so it doesn’t cover that but goes into great detail about everything else. It’s amazing what Russia has to deal with in regards to Chechen terrorism and its affiliated organised crime which is just as brutal. Special note of reference to the part regarding 9/11 I think you’ll be surprised. They also cover I think the Madrid train bombing. In France an Algeria-Chechen network smuggled in anti-aircraft missiles to shoot down airplanes at Frances Lyon airport but were intercepted by French intelligence. It is covered in the book. Did any of our media cover this? If you read the book I think you’ll realise that the whole Al Queda terror network is a myth. That OBL is a nobody. In the Kosovo war of 99 Psych-Ops interns were brought in to cover the war at CNN. In this latest war CNN used footage of South Ossetia and claimed it was the aftermath of Russian attack on Gori. Here’s a link to a good article on George Soros involvement in Georgia since 94. God created every single human with certain talents, in the intention that if humanity recognized those God given talents by letting people fulfill their God given role in life, then the human race could succeed and live in peace and harmony with one another. But Satan comes to murder, steal, lie, etc… so as to interfere with the plan that God created, and thus many who refuse to love God fall victim to Satan’s temptations and mess with the dignity of other human beings. We live in times whereby the zionists are living exactly the same as the godless Pharisees did almost 2000 years ago. They decided they were the one who controls all rights in the human race and people only have their rights if the zionists approve of them having their human rights. But God has never given the zionists the authority over whose God given rights would be respected and protected, so the zionists are just as much lost souls to hell as the first century Pharisees were told by Christ that their souls were hell bound up on their deaths. God has no partiality when judging all souls, but He does judge based upon His will and the willingness of each soul to obey and follow that will. Because the western nations have forgotten about the true will of God for many generations now, God is finally allowing the world scene to develop that will ultimately lead to a direct conflict between God and the zionists and their supporters. That conflict will see the glory of the God of Abraham in our world, as evildoers will be killed and their souls will be taken off to their final judgment by God. No military power on this earth has the ability to challenge God when Christ returns to wage battle against all evildoers. I can’t wait for that time when God destroys all evildoer souls, and gives them the ability to prove just how weak they are compared to His strength and truth. Everyday in prayer I thank God personally for giving me life and all the blessings that many take for granted, like the ability to walk, the ability to see, the ability to talk, the ability to see and understand His truth, etc… There is no way on this earth I will ever go and say this universe was the result of some big explosion event followed by just the right random events. Anyone who believes the evolutionist (materialistic) lie clearly is mentally challenged and a liar. There is no example in this universe where order can come from disorder by natural selection alone. Let all Praise and Honor go to God, the One and Only Creator of heaven and earth. The whole thing seems to easy to me. The Israelis as much as the Georgians and George Bushians know how to fight a war. Years to prepare, dig tunnels, establish supply routes etc and suddenly in a matter of days Georgia submits. Afghanistan and Chechnya have held out much longer. There are cocaine cartels in south America with more mox than these Georgians showed. The whole thing is BS, Condi being there is the dead give away. Something else is going on because to much attention is going to this unremarkable event. Lets not forget as well that Russia has been Jewish dominated since they revolted and put Stalin in power. The cold war was a big BS scam and so is this. Im recommending the story for an academy award. Jews have adopted traditional Russian sounding names to hide there identity the same as in Germany. Medvedev was probably a traditional Russian name that later Jews adapted especially prior and during the soviet era. Brother Nathanael Kapner is right Medvedev and his wife have been active in supporting the Orthodox church for years, Medvedev was the CEO of state oil and gas firm and Anti-Rothschild company Gazprom. Judicial Inc and other websites go out of there way to paint Russia as still Zionist dominated by showing Medvedev and Putin photos addressing the Jewish community there and pictures of Putin’s trip to Israel. Basically laying the script that hostility towards Russia is fake and it’s all just an act. If this is true then why is ACPC board of directors mostly Neocons and the Chechens main propagandist who helps run website, etc Jewish professor and Jamestown foundation director Glen Howard? Why is the Jewish run media so anti-Russian? Why is Frank Gaffney’s NED and Garry Kasparov who is affiliated with NED and AEI trying to over through Putin as well as numerous NGO’s? Why did the state department spend millions on sponsoring anti-Russian projects? Boris Berezovsky has bragged about having influence in both major political parties in Britain, bragged and has been confirmed that he helped finance the “coloured revolutions” in Ukraine and Georgia and publicly stated that he is spending millions to over through Putin by force. Yup James! And if one looks at the real reasons for the recent battles with Georgia, one can see how the western nations were attempting to setup missle shield bases all around the territory controlled by Putin and the others. They were hoping to place the missile shield right on the border of the Russian territory in order to stop them from having much ability to strike Israel. But Putin and the others know what the goals were of the western nations and NATO and now they have responded to the attacks that were started by the zionists. Russia has always retained the right to self-defense and defense of any of its allies in the region. The zionists don’t want to extend that right of self-defense to them though. So we are seeing the WWIII battle lines being drawn up. And the ancient Jewish prophets told us about this thousands of years ago. The zionists are walking into a time when God guaranteed they would almost totally be destroyed in their pursuit of establishing control over the whole world. A lot of unhappy Americans want to make this whole TINY trouble in the Caucasus more than what it is in the hopes of relieving their mental pain about the Jews and N.W.O., rather than get a life. They want to imagine that Mother Russia is now riding to their rescue and defeating the Bush agenda. Georgia is important to Israel, as a few of its generals are retired there and Georgia has a genetic link to what are mostly today called Jews. But the truth is Russia has not and is not winning in the Georgia for the contest was not one of war, there is nothing valuable in Georgia, it has no intrinsic value to America at all – heck even the vaunted pipeline only moves 1 million barrels a day (check out how much oil the world uses each day – only nations like Namibia would worry about 1 million barrels a day. Of course Israel worries since it invested billions into the pipeline. Heck I don’t even think the pipeline is that important to Russia. Now if someone built 10 more pipelines there Georgia might become strategically important. So there is nothing there worth a war or an invading army. I present on this blog the reasons I think this war took place and it was basically a US/Israeli trick on Russia in the first place - http://www.bestcyrano.org/cyrano/?p=849. Right now Russia is acting like the T-Rex in the first Jurassic Park. Do you remember how when the T-Rex couldn’t get to the kids how it became frustrated and became to bite the vehicle tires? Right now Russia is doing much the same thing, blowing up cheap Georgian infrastructure like old railway bridges. Wow, like the US couldn’t replace all that. Then Russia vaunted how it had captured a major US arms cache – 1400 guns!!! Yeah, like a Texas gun store couldn’t replace most of that in a day. You need to allow your ragged emotions to settle down from tall media (especially Rusky) hype and your anger at Zionism etc, and try to see things in an objective way. By the way , the Israeli and CIA planned use of arty drum fire on Ossetia - an atrocity now lost buried under all the myriad of pictures in the Western Media of ladies running away from Russian tanks and Russians breaking into a Georgian bank, and a woman news reported taking it from a sniper – was designed as an attack purposefully to force the Russians (by enraging them) to move one month too early, instead at the better time when the US takes on Iran. The bottom line – Georgia which had little intrinsic value to either Russia or the US – has now become a very happy news story of the US military industrial complex. Reports I have read state the US arms manufactures are very happy at this moment, seeing promises of new arms orders of big ticket items. One thing that may give you a grip on reality is to research for your self about the Sweden-sized economy of Russia, read about the true state of its military and the age of most of its equipment, or its ability to replace it with something new. Read about how its navy is still little more than a glorified coastal defense. Russia has no business acting like it is right now. It should have kept is profile low and continued in its SLOW buildup. Remember how Hitler was goaded by the West into going to war too early??? Putin should have paid attention to that old trick. WW3 is part of a more sinister plan this great conflagration is to be made and blamed on religion so tthe whole world or at least a vast majority of survivors will become atheistic. it’s about luring human kind into paganism into the occult. As for the who is responsible for this mess question : here is the answer we all are you can blame the bankers (and GOD ALLAH SUBHANE WE TAALA know these people are plain evil) but we are also quilty in this process ask yourself who takes loans from the bank instead of saving who spends on credit cards. Ask yourself where does their power come from i tell you: from us. We buy their toxic waiste(industrial food, hamburgurs ect) at the shopping mall we buy or rent or go to the cinema to watch their brainwasing garbage. We have given them all the power they have for we have become wicked ourselfs. We are the victims of our own ignorance. Now that doesn’t mean that the zionist are not evil or that the russians or not communists. By the way capitalism and communism are exactly the same a few people having all the wealth why the many have nothing. They are both created evil to break us to lower us and ultimately to destroy us. So you see it really doesn’t matter if their is a bear or zionist at the top. Only when people regain their lost faith will their be peace on earth. I think that a disaster like ww3 or nibiru or a pole shift or huge solar flares are inevitable. Dear Mike - Putin has purged the Jews out of the media and political realm. Firstly to comment on the topic written about in this article. As I’m sure it has become common knowledge to those who visit anti-Jew/anti-Zionist/alternative media sites that Israel and jewhorse America were in Georgia training the Georgian military for just this type of conflict a long time before the actual war broke out. Over a hundred of these military advisors stayed behind after the Isramerican-Georgian war games ended. And it so happened that they were in Georgia at the time that Georgia started the war by invading South Ossetia and attacking a Russian peace convoy. But of course, these military men were just there to take in the fresh mountain air. It is obvious that Georgia not only had the knowledge and approval of America and Isreal but that these two countries hepled plan the conflict. It appears that the Americans and Isrealis had assured the Georgians that they would be triumphant in the conflict. However, Georgia was just being played by the Jews (who control both America and Isreal) and it was these Jews that screwed over Shakashvili and the rest of the Government. In the beginning of the conflict the Georgians didn’t even deny that they had started the war, it was only after they realised they had been set up did they start to put the blame on Russia. Regarding Russia, as I have stated before in a post on this website, Russia and its government had been controlled absolutely by the Jews since Lenin and Stalin took over the country and killed the Czar and his family (funded by Rothschild gold of course). The Jews then introduced Communism into the country which is their favoured method of propagation and public control. They then setup their Russia against their America in the Cold War to suit their own money-making and control-gathering desires. Before that they had also setup Hitler (also funded with Rothschild gold) to war with the allies, once again to gain more control over countries governments, affairs and economies. It is most likely that the Rothschilds sniffing the demise of the Communist Contraption in the 90’s (since they had observed and instigated their fair share of regime changes) ensured that their control would continue when the Soviet Union fell this time by using Capatilism to control the country as well as the large amount of Jews who were and are still in the Russian Government. I am absolutely certain, without a trace of doubt, that Russia today moves to the will of the Jews. It is said by many sources in alternative media that the noble Russians and Putin are the last hope against the Zionists. However all is controlled by the Jews. Russia, America, Isreal, Georgia the lot… Oh yeah, I forgot to add that Mao Tsedong’s Commnist takeover of China was also funded with Rothschild gold so expect that China moves to the Jews’ will as well! The only thing that prevents the Rothschild’s from freely doing what they like is the masses. They still have to provide excuses to each countries’ respective public as well as politician’s not under their control. It often that the politician himself is not aware of the grand scale of things. So that is why the Jews stage their false political machinations and false flag attacks. And a message to one of this topic’s discussion participants. I disagree with your views of God. Personally, I believe the ‘God’ you talk about is beyond active interaction in this Universe. And when you say ‘Jesus will wage war’ and ‘God will destroy’, I am somewhat… lacking in words to describe my view of your perceptions. Remember: ‘those that live by the sword shall die by the sword’. Jesus, even when faced with his own death, would not kill the Roman soldiers who had come to capture him. I believe ‘God’ and ‘Jesus’ will remain removed from violent conflict. -THEY, those progressive Jews, are evil. Jim, I totally disagree. Georgia is important to Russia, just as NATO found it important to be setting up shop there. The surrounding regions of Russia, which are breakaway regions of the old Soviet Union, are what NATO and the west want to use to establish their missle shield so as to block Russia from being able to attack Israel and the western forces who want to attack Iran. It isn’t a coincidence after Russia clobbered the troops in Georgia that the news now says Poland has agreed to allow the the west to install part of the missle shield hardware on their land. The west and NATO wants any possible lead it can have to shut down its advance on taking over the middle east energy supplies. Russia is the largest threat to that in the region, and they will remain a threat no matter what happens at the hands of the zionists. Right now Russia is equipped to instigate an EMP attack on any nation in the region, which would essentially take the nation targetted back 100 plus years, to the stone age. I do believe that is why Russia made Poland’s leadership understand that this option is not fully off the table right now for options the Russian military can choose to do. As for all these morons who continue to say that the Russian military and economy is destroyed or in a primitive condition, I think you need to quit smoking pot or put away the illegal drugs, as Russia not only is as powerful as the United States militarily, but they are more powerful than us economically. They have no debt, they have surplus where they have bought some of our bonds and government debt. The US sits here on a 100 plus trillion dollar debt, acting like we are so strong economically when we are bankrupt. Militarily the Russians have just as advanced weapons as we have, and in some cases they have weapons systems better than what we possess. And when one involves nuclear weapons into the equation, we really should not be smiling and acting like we can win a nuclear exchange with them. Dear DCRB - Oh how easy it is to make blanket statements without proof or support. By fiat, “God spoke the Word and the heavens were made by the Breath of His mouth,” says the Psalmist, affirming the work of the Holy Trinity. I repeat on this website—HOORAY FOR PUTIN!! His actions overwhelm any words of the skeptics. I should point out what my political stance is, as I think it is only fair. I am committed to supporting the winning side, or more precisely the side that won long ago and now makes a pretense of still struggling to attain their major goals: yes, I support the N.W.O. and Zionism. Not that I especially like them (at times I still hate them), but I have certain sociological and biological scientific reasons for siding with them, and also I don’t want my children to waste their lives the way I spent 27 years wasting my life trying to do battle with them. Truth is, the real Powers That Be in this world have some great savvy in dealing with the masses – even though they employ many puppets that are somewhat clumsy and halfwit. Truth is they have spent so much time dumbing down everyone they are having trouble finding talented help. Good luck with your anger at The Powers That Be, but remember, long term anger will greatly shorten your life. I had this on another post, but it fits in better on this one. Like Saakashvili, Are Bush and Cheney War Criminal’s? - Who should be put on trial - or Just plain Nuts? ( check out bottom of article ). Russian investigators have launched a criminal case on charges of genocide in connection with the events in South Ossetia. Russia’s Interfax news agency reports that the Russian General Prosecutor’s Office has said Georgian President Mikhail Saakashvili may also be put on trial. According to the latest figures, about 1,600 residents and 74 Russian peacekeepers have been killed as a result of Georgia’s attack on South Ossetia. Speaking at a joint media briefing with French President Nicholas Sarkozy, President Medvedev said double standards are inadmissible when evaluating the actions of politicians who are guilty of mass killings of civilians. “The situation when one, who committed thousands of crimes, is characterised as a terrorist, and another as a president of a sovereign state, is very strange,” he said. Meanwhile, Marina Gridneva, a spokesperson for the General Prosecutor’s Office, told Interfax that Russian law allows for foreign citizens to be brought to trial if they have committed a crime against Russia’s interests. She said that evidence of murder, following the attack of Georgian troops in South Ossetia, may be used as a basis for future charges against Saakashvili. Aleksandr Torshin, Vice Speaker of the Russian Federation Council, said that Saakashvili and his closest allies must answer for their actions in front of an international tribunal. “In such a case there will be no trial against him. He would get a certificate, a ward, and everything would be explained that he is nutty. I fear such a development of events, and I have an impression that this variant is being considered in the west,” Torshin said. Advice to Bush and Cheney. You both should check yourselve’s into a mental ward. Once you enter the ward begin screaming ” I’m Crazy, I’m Nutty, I’m Screwey, I’m an Imbecile, etc. This way you may avoid the ultimate penalty of your being punished as a War Criminal! Just picture the punishment that you dished out to Saddam Hussein. If your not nutty than one day you may get the same. At least we know that you’ll get your just rewards when you enter Eternity! I wasn’t aware this was a site which thrived on anger or hate. I think its more knowledge is power. Those doing Satan’s will should turn to Christ, repent, and be baptised. Pretty simple really. Jim Eagle, again that posting was nonsense. The talented help is here, but the zionists refuse at all costs to let the talents be used precisely because those who have the talents also have a strong faith in the will of God, including the truths of God. What the zionists don’t know and have taken for granted is all the massive talents out here that one day will be united in seeing to their downfall, when Christ returns. Christ said that those who are truly His followers will turn the other cheek just as God wishes, but that doesn’t mean they are weak or that God is weak. We are giving the zionists ever chance to repent and turn from their wicked ways, a level of mercy that they are not giving to their victims in the world. Thus the price of them not extending mercy to their victims is going to cost them when their souls get to stand before God and they will get from God the same level of mercy they showed to their victims. On that day, all the money and wealth in the world is not worth a penny, but the actions of the zionists will condemn their souls to an eternity of pain and torment. God wins when all of this life has beens scored and judged and those who appear to be ahead now will be the losers in eternity. I have a question. Do you know anything about Saakashvili being a mason? If yes, than what degree and what fraternity. I love all you guys but God loves you more, of that I’m sure. First, Bro Nathan, I live in a cash driven society essentially and would be delighted if I could have an account to which I can donate my widower’s mite as often as I find the means to so do. Brothers, these are very trying times. We live in midst of very mad rulers, leaders stopped to exist a long time ago. George Bush’s body language is causing me great concern. Saakashvili and Bush both came off the same mould and to see Bush, shoulders slumped, voice toned down and mellowed is worrying. Bush and Saakashvili are all spoilt brats that have never learnt how to take NO for an answer-and looking at them now, I think to myself, what are these sick children going to go break next? Not all Jews are Zionist but I do know that all Zionists are Satanists-and I mean all, without exception. 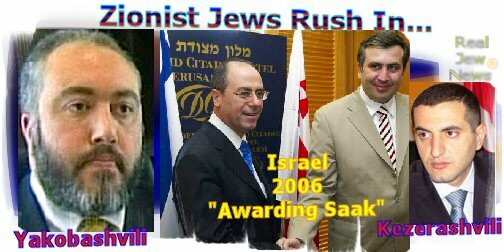 Harold Rosenthal, an Ashkenazi Jew said “Most Jews don’t like to admit it but our god is Lucifer” Harold Rosenthal at the time of that statement was an aide to another Ashkenazi Jew, American Senator Jacob Javis. I still want to believe that by most Jews, Harold meant Ashkenazi Jews. America has the greatest concentration of Ashkenazi Jews in the world today and it is not by accident that it is so. Their new Jerusalem is New York and that is were you’ll find them the most. The world to which the Good Book refers that will come under in brimstone and fire can be no other but America, it is there that they have ascended and see themselves by so doing as being on top of the world. So, my brethren, be of good cheer for the time is upon us. Continue to glorify the Living God and understand that George Walker Bush is the very key that opens the door to their self-destruction. Be of good cheer, for I tell you, it will soon come to pass for all eyes to see. Mikheil Saakashvili was born in Tbilisi, capital of what was then the Georgian Soviet Socialist Republic in the Soviet Union, to a Georgian intelligentsia family. His father, Nikoloz Saakashvili, is a physician who still practices medicine in Tbilisi and directs a local Balneological Center. His mother, Giuli Alasania, is a historian who lectures at Tbilisi State University. Saakashvili graduated from the School of International Law of the Kiev State University (Ukraine) in 1992. He briefly worked as a human rights officer for the interim State Council of Georgia following the overthrow of President Zviad Gamsakhurdia before receiving a fellowship from the United States State Department. He received an LLM from Columbia Law School in 1994 and Doctor of Laws degree from The George Washington University Law School the following year. In 1995, he also received a diploma from the International Institute of Human Rights in Strasbourg, France. After graduation, while working in the New York law firm of Patterson Belknap Webb & Tyler in early 1995, Saakashvili was approached by Zurab Zhvania, an old friend from Georgia who was working on behalf of President Eduard Shevardnadze to recruit talented young Georgians to enter politics. The George Washington University, like much of Washington, D.C., traces many of its origins back to the Freemasons. The Bible that the presidents of the university use to swear an oath on upon inauguration is the Bible of Freemason George Washington. Freemasonry symbols have blatantly been located all throughout campus including the foundation stones of many of the university buildings. The Freemasons feel a special bond in helping the school throughout its history financially. Yes, long term anger toward God and His will does shorten your life, as eternity in hell isn’t worth receiving for having a longer time of fun in your flesh while on the earth. Maybe you don’t understand the meaning of the word “eternity” or you understand it but refuse to accept it, but God’s will overrules any of the wishes of man, including those who think they have the power to challenge God’s authority because they built kingdoms on the earth from their wickedness. It is much better than a soul live a short number of years in holiness and honesty in this world than live a long earthly lifetime filled with constant sin. So go ahead and support the zionists and have yourself a few more years of pleasure, but I would strongly advise you to reconsider what that is worth in comparison to facing an angry God when you die and getting His wrath for all of eternity. Sorry for incompetent question. It really doesn’t matter. Anyway freemasons were and always will be antichristian plague, destroying integrity of Christianity, having its roots in cabbala and talmud. I heard Human Rights Watch has some connection to George Soros. Its board of directors in Russia at least include the Rothschild’s and run through the Carnegie Endowment NGO. If it’s independent then why does it have to be filtered by an NGO? I think it’s more than just Zionism. Richard Hoolbroke is not a Neocon but anti-Serb/Russian and is pushing the line that Russia will invade Ukraine next. Promoting the idea that Russia will invade a former soviet state country is dangerous as Ukraine has a large ethnic Russian population and the fact the Ukraine mercs were used in this Georgian operation a false flag terror bombing in the west of Ukraine or border skirmishes could be a pretext for a mass ethnic cleansing campaign. Not only in Ukraine but the Baltic states as well. I think it has more to do with what Henry Ford called the international Jew who has no loyalty to her nation state. Zionism at the time was supported by Winston Churchill and the Nazis as a means for Jews to support a national cause in Palestine rather than an international cause communism. The only problem is they’ve continued there new international cause of ziocracy with what the Talmud describes the wealth of the nations going to Israel. Given the fact that so many “for the sake of humanity” organisations have spurious financial sources (usually zionist/freemasonry), then I tend to assume that virtually all such organisations serve the dark “rulers of the world”, unless proven otherwise. To reflect back historically, the Church tended to be the source of charity, supporting the weak and vulnerable (equivalent to “human rights”) and provide a counter-balance to the abuse of power occasionally committed by the powerful. Also Christ himself commits a Christian quite clearly to use the law of love and compassion in solving disputes and to seek the justice of God in their actions. Whereas most of the modern day organisations appear to be good at producing “opinions and facts”, which one way or another either get ignored or distorted to serve alterior interests. It is most important that the modern day Christian enforce the law of love within their parish and through that point into society. This is the beauty of the Christ and His Kingdom. It is so simple! No need for complex organisation just commitment to Christ himself. Thus, will there be a need for all these “organisations”? It’s interesting Brother Nathanael how you posted article together about George Soros, Brezinski, the Rothschild’s and Russia just before this event happened as if you prophesied it. Yes, Dear George, you are absolutely right. You know what is theater of one actor? You create crisis and propose solution at the same time, like create viruses and antiviruses, to keep business going. That’s a masonic motto - “Ordo ab Chao,” Order out of Chaos. But in the case with Russia I pray they gonna terribly and shamefully fail once anf for all. Has the US Secretary of State got her cassette stuck? For a week now she has been reiterating the same phrase “Russian forces must leave Georgia now” and for a week now the world has been informed of Georgian war crimes against Russians in Ossetia. The war crimes happened, the Russians call the shots now, Ms. Rice. Like it or lump it. Is Condoleeza Rice stupid? OK her boss is, we all know that and that’s why nobody pays any attention to what he says or if they do, it is to have a good laugh at how such an imbecile could supposedly rule the roost in Washington (when everyone knows it is Cheney and his energy and arms lobbies). So Bush gets a discount, like the uncle that farts at family dinners, like the retarded nephew who belches swearwords after his third litre of Coke, like the simpleton that sits outside the church on Sundays begging for money informing everyone that he is an astronaut on Thursday afternoons. Is Condoleeza Rice stupid? She claims to be a Russian expert but her command of the language was recently exposed as being basic/ elementary level on a Russian radio programme, just as her grasp of what is going on in Russia today seems beneath the informed blogger level. Is Condoleeza Rice stupid? How can this female purport to broker events between an evil regime in Tblisi supported by her own evil regime in Washington, and Russia, while not mentioning one single time the war crimes committed by Georgia against Russian peacekeepers and civilians? So we come to the conclusion that she is either stupid, or incompetent, or downright evil. If she didn’t know about Georgia’s war crimes, when everyone else did, she is incompetent (as she proved as National Security Advisor during 9/11). If she knows about the war crimes and fails to mention them, as Secretary of State, she is plain stupid and if she purposefully covers them up, maybe because her own armed forces were involved, then she is one evil piece of work, as many of us suspected all along. Speaking of Stupid - Bush was pounding his fist like Khruschev’s shoe - and bellowing a lot of hot air about Russia. Now Gates follows up and contradicts everything that Bush said. It’s almost as if the power’s behind the scenes have said just pretend that Bush doesn’t even exist. A real President would have fired Gates immediately for contradicting him. But it’s apparent that Bush is not a real President, merely a bumbling/mumbling Idiot! And even Pat admits that Georgia started the silly war, that cost thousands of lives. The entire world, except for Americans, knows that the outbreak of armed conflict between Russian and Georgian forces in South Ossetia was entirely due to the US and its Georgia puppet, Saakashvili. Americans, alone in the world, are unaware that the hostilities were initiated by Saakashvili, because Bush, Cheney and the Israeli-occupied American media have again lied to them. Everyone else in the world knows that the unstable and corrupt Saakashvili, who proclaims democracy and runs a police state, would not have taken on Russia by attacking South Ossetia unless given the go-ahead by Washington. The US is not a superpower. It is a bankrupt farce run by imbeciles who were installed by stolen elections arranged by Karl Rove and Diebold. It is a laughing stock, that ignorantly affronts and attempts to bully an enormous country equipped with tens of thousands of nuclear weapons. My Comment: Good stuff by Mr.Robert’s. Can’t source your essay White Women: Dumb As A Post. - reliance on something-for-nothing welfare benefits. set by the lowest common denominator among us. - of escaping her seduction - is lost. advance her purpose when on the march. Her political philosophy is always left-wing. responsibility, good social order and human progress. May St. Andrew of Constantinople, Holy Fool for Christ, bless and strengthen Brother Nathanael and all of us. It must be a real shock to some braindead Americans that their Head lier Bush the Zionist lap Dog and his BP conartist failed to gain control of the pipeline. I guess their American Iraq and Zionist advisors failed to take into account preparing for a real Army. But as shown they used the tried and true method of Bombing women and children like in Iraq and Palestine. I guess they have found out that the Bear is not going to stand for the Zionist Blackmail world policies that have been implemented in other parts of the world.BRAVO for Russia! Yes, I am sure we have reached saturation point with lies broadcast 24/7 on all goy channels. To discover what exactly is going on with informed comment you have to read this website. Pravda while taking the Georgian actions very seriously is also finding humour in the defeat of the American / Israeli stooge Saakashvili. They have published a video of him on the phone to his W. Handlers eating his tie and shitting his pants as his assault upon S. Ossetia is rolled back. The ordinary human sympathy that one would naturally feel for someone having a nervous breakdown will not be found for Saakashvili as he undergoes his moment of truth. From his meltdown, it is evident that he realizes he is in the spotlight as the aggressor in S. Ossetia. The Russians are not in the frame because the Zionist West does not have information dominance. The deaths and atrocities of his doing will not this time be laid upon those who were defending themselves as is usually the case with these American / Zionist Jobs. rebbes in Washington watch the Pravda video. A Ziobot in the spotlight is not salutary, and there will be worse to come. The good news for beleaguered humanity, yes even this abject worm Saakashvili loaded with sins is that we have a Saviour and a King who must reign until all his enemies are under his feet. And to his Saints he will give a kingdom that will have no end. It is not too late for even someone like Saakashvili to turn now and throw himself upon the mercy of the Sacred Heart. zens here and in Great Britain. of that brand of Leftism…). It comes as no surprise……. It maddens me, when I see “Freedom of the Truth”, repressed…..
Those so called FSWC…..do not want people to learn the real truth behind the the Stalins, the Hitlers, the US Government, Georgia, Lebanon, Iran, etc., etc., etc. You’re a Noble Peaceful Warrior, and I respect and admire your Integrity, Courage and Honour!!! as did the former Prime Minister, and the one before that, and the one before that…. I know you’re website, provides Excellence in Reporting…..as what journalism should be…..Objective and Based on Substantiated Facts…..unlike, well, Fox, ABC, MSNBC, CNN, etc., etc. WE ARE ALL UNITED WITH YOU!!! Medved in Russian means bear. Ethnic Russians have last names that have to do with Russian words or names. Jews from Russia have completely different last names, and are almost always distinctive. Once in a blue moon you will come across a Jew from Russia with a pure Russian last name, but that is because they are not fully Jewish. Russian Jews in the West and everywhere else have taken the title of “Russian” to the point where everybody else believes all Russian-speaking people are Jews. Our Culture in North America is no longer ours. The reason for this also is because Russian people are pushing out Jews from the country.